The Apples in Stereo, one of the more well known Ele­phant 6 grad­u­ates, released its sev­enth album this past Tues­day, and as always, The Apples has come in force with its fair­ly uncon­ven­tion­al take on pop. Trav­ellers in Space and Time is a con­sis­tent­ly enjoy­able album, and on many tracks, much more. Trav­ellers is not always per­fect, excel­lent, or amaz­ing, but it nev­er strays below being good. Fol­low­ing the odd­ly archival intro to Trav­ellers, the famil­iar ener­gy of Robert Schneider’s voice soars into the album with the phe­nom­e­nal “Dream About the Future.” Always pos­sessed of an infec­tious joy that quick­ly spreads to Apples in Stereo’s already strik­ing­ly vivid sound, Schnei­der gives the music a tran­scen­dent vocal ele­ment as he cries out the often odd and always enter­tain­ing words of Trav­ellers. Schnei­der switch­es effort­less­ly between love songs: “Dream About the Future“ ‘s “When I tell you it’s not over / You don’t believe me,” and “Strange Solar Sys­tem“ ‘s futur­is­tic mus­ing. Trav­ellers uses the famil­iar mix of Schneider’s nat­u­ral­ly ani­mat­ed vocals and heavy, near-robot­ic pro­cess­ing to cre­ate the unearth­ly sound (often lay­ered with Schneider’s unprocessed voice) seen on tracks such as “Strange Solar Sys­tem,” which cre­ates an enter­tain­ing mix of indie and psy­che­del­ic styles. Com­bined with an eclec­tic mix of lyri­cal sub­jects, this cre­ates a quite diverse vocal ele­ment to the album, mak­ing the lack of diver­si­ty through the rest of the album all the more unfor­tu­nate. 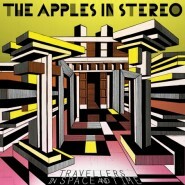 On Trav­ellers in Space and Time, The Apples in Stereo uses a dense sound, packed with a wide vari­ety of instru­ments, elec­tron­ic and oth­er­wise, all work­ing very close­ly with one anoth­er to cre­ate what­ev­er sound is nec­es­sary on any par­tic­u­lar track - not a huge sur­prise. Also not ter­ri­bly sur­pris­ing­ly, Trav­ellers con­tains some spec­tac­u­lar results. Imme­di­ate­ly fol­low­ing the open­ing sound clip is “Dream about the Future,” a quirky, cheery (despite the lyrics), dense, but by no means con­fus­ing, hor­ri­bly catchy, and ulti­mate­ly excel­lent track. But “Dream about the Future” was a ter­rif­ic track on its own; why The Apples decid­ed to fol­low it with a few more tracks that sound­ed almost exact­ly the same is not eas­i­ly deter­minable. In gen­er­al, the biggest prob­lem with Trav­ellers is that the inven­tive­ness that per­me­ates the instru­men­ta­tion does not always per­me­ate tracks’ designs. Far too many tracks on Trav­ellers sound far too sim­i­lar, and oth­er tracks sound lit­tle bet­ter than new­ly orches­trat­ed rehash­es of tracks you feel you must have heard before. Still, Trav­ellers in Space and Time is always enjoy­able, a great album in any set­ting, from an acousti­cal­ly designed room with a 50 thou­sand dol­lar audio sys­tem to a col­lege dorm with a 600 watt sub­woofer. When Trav­ellers is good, it’s excel­lent. “Dream About the Future,” which is quite like­ly one of the band’s best tracks in almost two decades of music, bears tes­ti­mo­ny to this fact. At the same time, it’s cer­tain­ly dis­ap­point­ing that much of the rest of the album doesn’t con­tain the same lev­el of cre­ative genius as those inspired sec­tions. Much of the album seems very sim­i­lar, which isn’t hor­ri­ble giv­en that even mediocre mate­r­i­al from such a cre­ative band comes out above-aver­age, but after six­teen tracks, a decent major­i­ty of which seem repet­i­tive, such a trend begins to eclipse the excel­lence. As such, Trav­ellers as a whole is good; it’s just not great.